Seniors and special needs dogs are the most difficult for CMSR to rescue. They are often hard to place in a new home and remain with us for extended periods until we can find an adopter—sometimes for the rest of their lives. They generally need much more veterinary care than young healthy dogs. The costs often runs $1,000 or more for just one dog—and that cost is not passed on to their adopters. On the other hand, most are really nice dogs, many of whom have been neglected much of their lives. They are clearly very grateful when they get to live with someone who loves them and takes proper care of them. Please consider adopting a senior or special needs dog. They fill very large holes in your heart that you may have never known were there. Whether or not you can adopt one, please help by sponsoring one our seniors/special needs dogs. CMSR is a 501(c)(3) charity, so contributions are tax-deductible to the extent allowed by law. Contact John Hoffman at cmsr@johnehoffman.us with any questions about sponsoring. 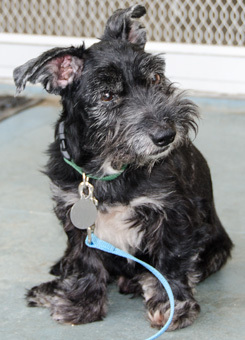 Orson is a super cute little terrier/spaniel mix. The shelter estimated his age at about 10. We think he is more like 8. Poor Orson has cataracts and badly needed a dental. Orson has cataracts in both eyes. Surgery to let Orson see again will cost about $3,500. 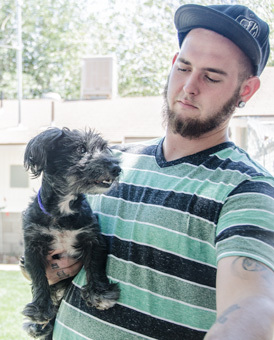 This photo was taken right after we got Orson out of the shelter and he seemed to love Corey Nagel who is holding him in the photo. Orson likes people and other dogs. We don't know yet how he is around cats. Orson appears to be in good health apart from his cataracts. He is neutered, microchipped and up to date on vaccinations. Orson is being fostered in North Hollywood. If you would like to adopt Orson, please submit a completed Adoption Application form. Contact John Hoffman (cmsr@johnehoffman.us) with any questions about him.